With London Fashion Week coming to the end and passing the green light to Milan, let me summarize my weekend out and about for shows, events and presentations. 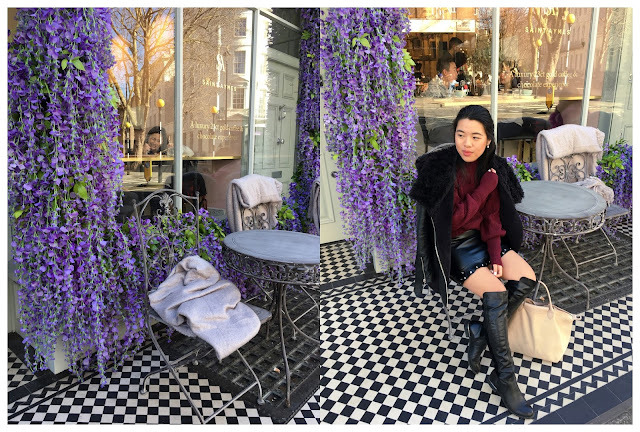 So blessed with the warm and sunny weather over the weekend in London and prayed for this weather to stay, as I was so ready to welcome the spring! Sadly, Monday has welcome the new week with cloudy and rainy weather. Nevertheless, London was fuelled up again with street style, ranging from classic look to crazy colourful ones and great catwalk shows and presentation where established and emerging designers had a chance to showcase their newest collection and tap into the trends of Autumn/Winter season. Seeing the bold colours, tailored famine suits or sophisticated layers of dresses, all of these fashion forward trends we have been able to observe on the catwalk. Running in between of shows, events, there are 6 key things to always had in mind while you are having busy fashion week schedule! 3. organize your time and plan in advance - you don't want to miss a show, meeting or run to a different location of the venue. Plan your day in advance and prioritise what you want to see and where you should be. Time is precious, thus don't try to be everywhere. 5. portable charger - not having your phone or camera with you is pain. Especially when you want to connect with people, when you need to keep in track of your events or if you want to call Uber home (Use code thuyp1132ue for ££ off your first ride). So make sure to bring portable charger with you! On my 3rd day, I am wearing a burgandy balloon sleeve sweater from Bershka, frilled faux leather mini skirt from Boohoo (get similar in Nasty Gal) and my favourite CCC high knee boots (get similar one in River Island), which are the perfect wardrobe item when I want to dress in dresses or skirts in winter! Hope you are all following my Instagram feed and stories from my LFW journey!